The European Union has launched a new program to tackle the threat of space junk, which litters the corridors of Earth orbit. Space junk is man-made debris — spent rocket stages, dead satellites and even lost spacewalker tools — orbiting Earth. 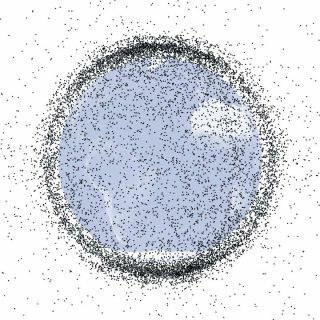 These bits of detritus pose a risk to orbiting satellites, which even a small piece of space trash could damage or destroy. There are thought to be about 600,000 objects larger than 1 cm (0.39 inches) in diameter orbiting Earth, and at least 16,000 larger than 10 cm (3.9 inches). Satellite operators rely on Earth-based tracking programs to locate this orbital debris in time to maneuver spacecraft out of the way of impending collisions. "Some EU Member States have national systems, radars or telescopes that could be used for monitoring satellites and space debris, but all in all, European satellite operators almost completely depend on United States SST [space surveillance and tracking] information," European Commission officials said in a statement. "However, with increasing space activities, the U.S. will no longer be able to meet the information needs of an increasing number of spacecraft operators." European officials propose making contributions toward each country's costs in setting up and operating space junk-surveillance programs. Improved tracking could save satellite operators significant amounts of money. Officials estimate that losses from space junk collisions, plus the risky maneuvers necessary to avoid impacts with space junk, cost European satellite operators €140 million ($182 million) a year, and the costs could rise to €210 million ($273 million) per year within the next decade. "Today, the only effective way satellite operators can mitigate collision risks is to move their satellites out of the way as soon as a collision risk has been identified," officials said. "Each such avoidance maneuver costs fuel and shortens the satellite's lifetime. Some European space agencies operating satellites report that, on average, they carry out one collision-avoidance maneuver every month." And the space junk problem not only affects the companies that operate satellites in Earth orbit. It has repercussions for most of the planet's population, which increasingly relies on satellite technology in everyday life. "Without being aware, European citizens rely on space technologies when they use their mobile phones, make financial transactions, take an airplane, watch the weather forecast or look for the nearest restaurant in their cars," officials said. "Any interruption of services which rely on space-based systems can have dramatic economic consequences." Follow Clara Moskowitz @ClaraMoskowitz. Follow us @Spacedotcom, Facebook or Google+. This article was first published on SPACE.com.